2. (i) Write any five ‘Islamic provisions of 1973 constitution. (ii) What do you know about Lucknow Pact? Lucknow Pact refers to an agreement between the Indian National Congress and the Muslim League. In 1916 Muhammed Ali Jinnah, a member of the Muslim League, negotiated with the Indian National Congress to reach an agreement to pressure the British government to adopt a more liberal approach to India and give Indians more authority to run their country. This was a considerable change of policy for the Muslim League, as its position had been that to preserve Muslim interests in India, it needed to support British rule. After the unpopular partition of Bengal, the Muslim League was confused about its stand and it was at that time that Jinnah approached the League. Jinnah was the mastermind and architect of the past. (iii) Highlight the Industrial Development of Pakistan. Law and order situation of the country should be improved enabling the investors to invest money without fear of loss of life or assets. It is necessary for the development of trade and commerce and industry that rules and regulations for trade should be made easier and simplified. It is necessary for the development of trade and commerce and industries in Pakistan that suitable training should be proved the staff. A sense of dignity of labour to work and doing hard work for more productions. It is great need of time for the development of industries that a stick system of quality control should be setup. There should not be compromise on the quantity and standard of the finished product. It is also necessary for the development that the standard of the education of marketing a business administration should be improved so that the demand of industrial products could be increased by introducing them in the public. It is necessary for the development of industrial sector to establish the foreign trade the smuggling of foreign commodities in Pakistan should be stopped. Working condition of workers: It is necessary for the industrial progress and to solve the industrial problem in Pakistan. The Govt. should establish industrial research institution. (vi) what you mean about indus basin treaty? (v) Write the salient feature of allama Iqbal’s presidential address at allababad . India is a continent of human groups belonging to different races, speaking different languages, and professing different religions. Personally, I would like to see the Punjab, orth-West Province, Sindh and Baluchistan amalgamated into a single State. Self-government within the British Empire, or without the British Empire, the formation of a consolidated North-West Indian Muslim State appears 0 me to be the final destiny of the Muslims, at least of North-West India. (vi) Explain he historical importance of Moen-jo- aro. Mohenjo-daro was built in the 26th century BCE. It was one of the largest cities of the ancient Indus Valley Civilization, also known as the Harappan Civilization, which developed around 3000 BCE from the prehistoric Indus culture. At its height, the Indus Civilization spanned much of what is now Pakistan and North India, extending westwards to the Iranian border, south to Gujarat in India and northwards to an outpost in Bactria, with major urban centers at Harappa, Mohenjodaro, Lothal,Kalibangan, Dholavira and Rakhigarhi. Mohenjodaro was the most advanced city of its time, with remarkably sophisticated civil engineering and urba..n planning. When the Indus civilization went into sudden decline around 1900 BCE, Mohenjo-daro was abandoned. (vii) 14th August 1947 is an important day in our life. Explain. 14 August may be a common date of the English calendar for the rest of the world, but it holds massive importance in the life of every Pakistani, as it is the independence day of our dearly loved country Pakistan. 14th August 1947 is considered as the most significant day in the history of Pakistan, as it marks the Independence Day of our country. 14th August has a great importance in the history of Pakistan. To pay honor to the sacrifices of our leaders an.d people, and to celebrate the independence of Pakistan, 14th August is celebrated every year with great passion. ;rhe Independence Day is celebrated with joy and pleasure to show our happiness of being independent on the map of the world. The whole nation of Pakistan celebrates the Independence Day to thank Allah for giving us separate homeland where we can spend our lives according to teachings of Islam. (viii) State important points of the Independence Act 1947. 6. Abolition of the use of the title “Emperor of India” by the British monarch (this was subsequently executed by King George VI by royal proclamation on 22 June 1948). 3. Explain Two-Nation Theory in the light of Allama Iqbal’s statement. Allama Iqbal the poet, philosopher and a great thinker with the help of his poetry tried to awaken the Muslims of the sub-continent. He believed the separate identity of Muslims as a nation. 4. Describe the basic principles of the Foreign Policy of Pakistan. 5. 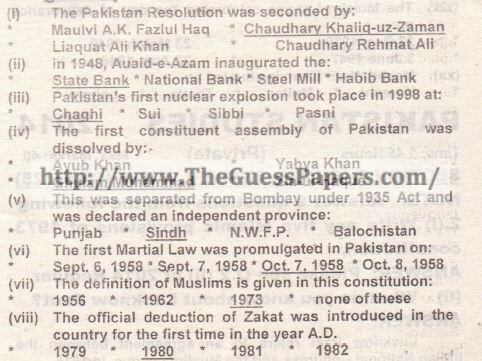 What role was played by the Muslim League in the creation of Pakistan? “Lucknow pact” through this pact tt- Congress re the separate of Muslims. SIMAN COMMISSION: In 1 27, Simon Commission was s -India under lhe,.chairmanship of Sir John Simon to uslim Hindu difference. It wa rejected because there as no Indian member on the commis on. (3) JINNAH’S FOURTEENPOI is- 1929: The Quaid· e-Azam refused to accept the Ne u re ort. In order to protect the Muslim point of the political issue of South Asia, he prepared a draft of guiding principle onsisting of 14 polnta popularity known as “Jinnah fourteen pints”. 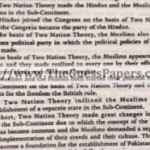 In 1930, in his presidential addre at annual session of league at Allahabad, Iqbal proposed the formation of a separate Muslim state be combining Northern and Southwestern Muslim majority region in sub-contient. 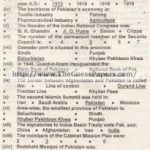 (5) PAKISTAN RESOLUTION- 1940: Attitude of the Hindus made it clear that the Hindus and Muslims were two separate nations. On 23rd March at annual session of Muslim Ie e ‘ e mous re ution commonly known as Pakistan ion s pass d. It was presented by Maulvi Fazlul Haq. (6) IPPS I SION – 1 42: Sir Stafford Cripps was sent by the British Government to In ia to discuss with Indian leaders, the future Indian constitution. His pro osal was rejected by both the Congress and the league. The Congress characterized them as ” a post dated cheque on a failing bank.” . (7) GANDHI JINNAH TALKS – 944: Gandhi held talks with Jinnah to discuss about the futu e of India, but no fruitful rebuilt came out of it because Gandhi did not accept Muslims as a separate Nation. (8) SIMLA CONFERENCE- 1945: Lord Wavewell called a conference at Simla. The conference failed to achieved any purpose due to one sided attitude of Lord Wavewell. In this conference Quaid-e-Azam made it crystal clear that the Muslim league can represent Muslim of India. (9) GENERAL ELECTIONS 1945 – 1946: Election for the central and provincial assemblies were held in 1945 -1946 which Muslim league won 30 seats of central legislative meant for Muslims and 43 seats out of 495 in the provincial legislative. (10) CABINET MISSION 1946: Cabinet mission visited ‘a in 1946 and submitted its recommendation to the shes As a result interim Government was formed but congress and league could not British co-operate against themselves. (11) 3rd JUNE PLAN 1947: Lord Mount Batten prepared the plan for transference of power according to the wish of the people. He emphasized the partition of the country and told that it was the only sogrtlon of the Indian political deadlock. Both league and congress accepted the plan. 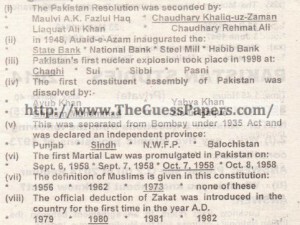 (12) CONCLUSION: Muslim league thus got his object and Pakistan was created on 14th August 1947. In short we can say that the creation of Pakistan is result of the efforts to the Muslim league and the great heroes. OR Write note on any four Regional Languages of Pakistan. Pakistan is a multi-lingual country. No less than 24 languages and dialects are spoken by the people of Pakistan. There are five regional languages. Punjabi, Sindhi, Pashto, Baluchi, Brahvi and Kashmiri. These languages are rich in . iritual quotes of their respective saints and contribute greatly to the culture of Pakistan. Punjabi is the language of the province ‘Punjab’. It links back to the Aryan language Prakrit. However, with time, the vocabulary of Punjabi language became a mixture of Persian, Arabic and Turkish words. It has different dialects in different parts of Punjab like ‘Saraiki’ and ‘Potohari’. But the basic language remains the same, Panjabi is rich in mystical and romantic poetry. The highly imaginative and artistic exquisite literature, mostly in verses has two forms. One is “Lyric Poetry,” which includes Bait, Kafi-si-harfi, Bara Mah and Satwara. The other one is “Narrative Poetry,” which is composed of various rhythms and meters. 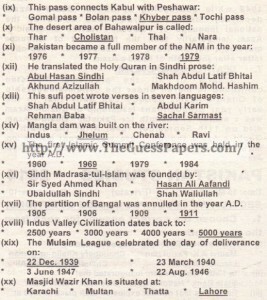 Examples are Qissa Noor Namah, Guizar, Jang Nama and Vaar. Sindhi is one of the important regional language of . Pakistan. 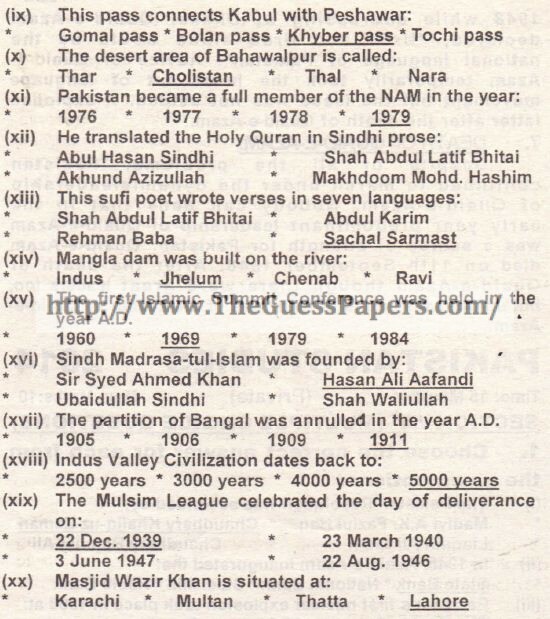 It appears that Sindhl was spoken in the Indus Delta from time immemorial. It is. said that the language of the people of Moen-jo-Daro contained elements of present era Sindhi language. Literature produced by earlier poets is not in records, as it was preserved traditionally in the memories of the people. . No newspapers or books were. published in Baluchi up till 1940.After partition, however Baluchi literature received a little boost. It was due to the efforts ma e by various or aniza ions and due to establishment of TV stations. 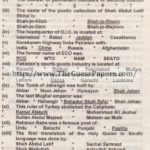 At present, Baluchi literature is on the road to development. Pashto is the regional language of the N.W.F.P. and tribal areas. It belongs. to the East Iranian group of languages and contains many Persian, Arabic, Greek and Pahlavi words. Steps taken to enhance Pashto: Although Pashto is an old language but its literature is comparatively a new one. After independence education spread rapidly and Pashto literature received a great boost. The Pashto Academy Peshawar, some other literary societies and educational institutions such as Islamia College Peshawar helped develop Pashto literature.